Hi Guys! Are you working on a needlework project? If you like to embroider flowers, a bullion rose is one of the most interesting flowers you can make. This rose is made with embroidery floss but looks great with ribbon embroidery or crazy quilting. 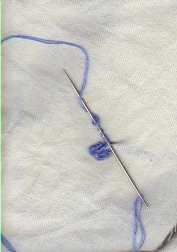 Bring the needle up through the fabric and wrap the thread around the needle. Bring the needle back down through the fabric where you want to place the petal. Hope you have some fun with this embroidered rose. A fan quilt is often called grandmother's fan, and the pattern is not difficult to make. It also has lots of uses, since you can use four fan squares to make a circle or two fan squares for half a circle. You can make a pillow or a lap quilt, or if you are ambitious, a full-size quilt. A 7-inch block is a good size for the fan quilt, and four of these will make a 14-inch pillow. 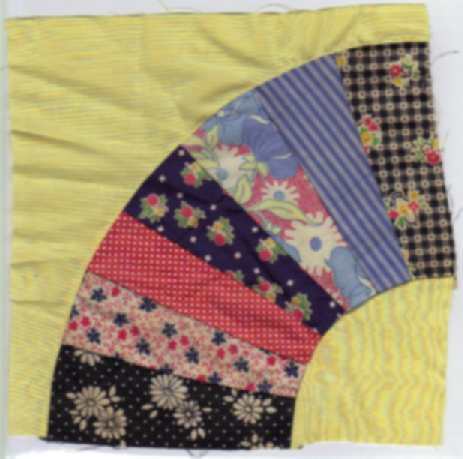 Here is a grandmother's fan quilt block from the 1950s I received from my cousin in West Virginia. We worked on this quilt a couple of winters, and never finished it. I have made a few pillows from the blocks, and have some left to work. If you want to make a fan quilt pattern, I would suggest that you make fewer spokes in the fan, since seven is more spokes than you really need. You don't need any real knowledge, but you need a ruler and something that measures degrees. If you quilt, you probably already have that. You can whip out your own pattern in no time. Three sections require 30-degree spokes. I noticed a recent Fons and Porter's "Love of Quilting" magazine has 3-section fan blocks made into a quilt on the front cover. Five spokes require 18 degrees for each, and six spokes of the fan take 15- degrees. Make some blocks, trim them straight and sew them in a circle or a semi-circle to make a colorful pillow or crafts project you can enjoy for years to come. This is excellent use of your time while the weather is cold, and you know you like to do sewing crafts. Quilting is one of my favorites and I love to share! See you again soon!